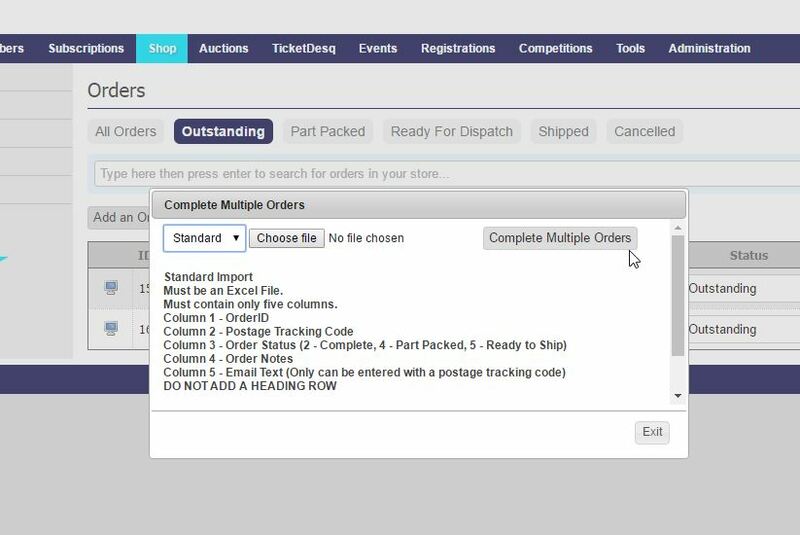 When handling a large volume of orders, it is possible to make a mass update to the status of a group of orders by uploading the new information into the Orders page. 2. Within the Management Console, select Shop from the top menu, then Order Management from the left menu. 3. From the dropdown labelled Choose an Action, select Import Shipped Orders. This allows you to make changes to the status of a large volume of orders at once. 4. Click on Browse in the window that will open for importing orders, and find the Excel Spreadsheet that you created previously. 5. Click on Complete Multiple Orders. This will upload the information in the spreadsheet to each of the orders that are to be updated. Note: When creating the spreadsheet, make sure that you include the Order ID in the first column and only information in the first four columns. This will ensure your orders get updated correctly with no problems.